fo friday. three for them and one for me. …so far, 2012 is looking like a different kind of knitting for me. less sweaters. more cowls. especially lace ones. and more for others. one of my goals is 12 hats for charity. on new years day I had one. and now I have three (and the fourth is on the needles). 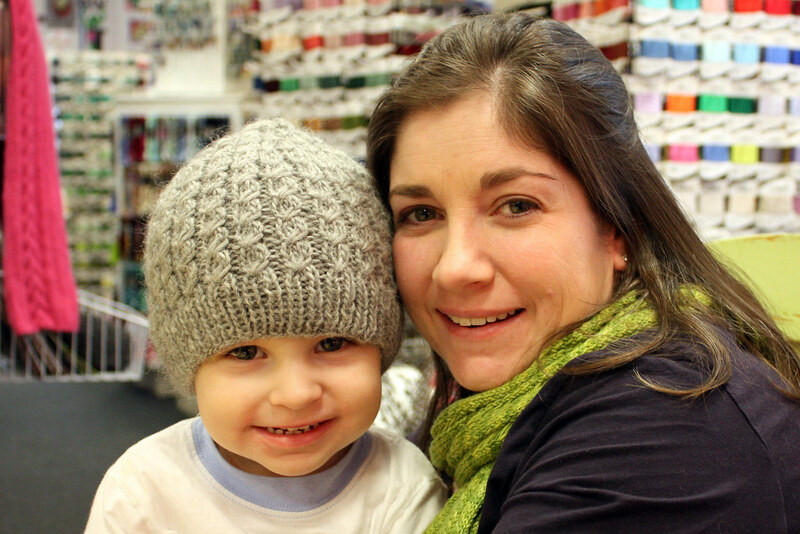 I love that I’m making these hats from yarn I have…and that it’s yarn I love. I know a hat that’s not washable might not be practical…but it’s nice. and I’m sure there are folks who need a bit of nice with their hats. and to carter by himself! – this is turning, a new hat pattern that I won in a blog giveaway! next up is a cowl for katie’s future mother-in-law, jane. she has a banner birthday this weekend and we’re going to celebrate it later this month (with brunch at murphy’s). this one is definitely hard to give away! a noble cowl. raveled here. …and finally, the one for me. this is my first maggiknits. a fur-collared capelet. even though I converted the pattern to have the knitting be seamless, I had to spend hours this morning weaving in ends and sewing on the fur collar (twice – am I the only one who didn’t realize a fur collar had a right and a wrong side?!) in any event, I love the finished project and I’m excited to cast on my next maggie’s! Everything is beautiful—but the Maggi Knit-fabulous! Awesome knits, that capelet is perfect for you! so beautiful, all of them! love the capelet. Beautiful work Mary! That capelet is so cool! ooh, the cowl is gorgeous! wow! love the hats – love the cowl for Jane – Rob said she is going to LURRRVE it – and lovvve the fur! Look at you! Stunning! Wow! You have been on a roll! Every last recipient, including you, will absolutely treasure these knits you made with love. Mary, the capelet is gorgeous. And the cowl. And good on you about the hats. And especially on using good yarn. Just because it's for charity doesn't mean it shouldn't feel good. I remember making 3 hats a few years ago for homeless people; I used Jo Sharp because it felt so soft (it isn't as if just because someone is homeless they don't have feelings) and I was so happy. Congratulations! Oh my gosh – that capelet is beautiful! I knit a lot of cowls last year. They are great for keeping warm. Carter is an adorable model! Love how you look (what I can see of you) in that capelet. I've never sewn on a fur collar but now I'll have your knowledge, if I ever do!